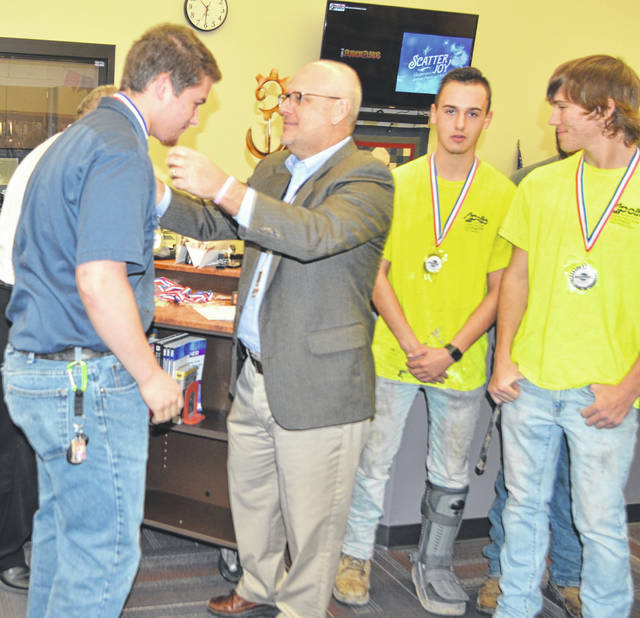 Apollo Career Center Superintendent Keith Horner presents Apollo Career Center senior Andrew Klay with his gold 1st place medal from the Makerfest skilled trades competition at the Apollo Career Center, Tuesday. 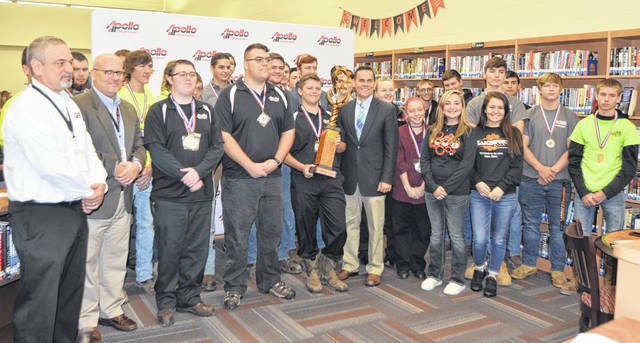 Jeff Sprague, Doug Arthur and Keith Horner present Apollo Career Center students with individual awards from the Makferfest skilled trades competition and the Maker Cup at the Apollo Career Center, Tuesday. LIMA — Students at Apollo Career Center celebrated their 4th Maker Cup win from the MakerFest skilled trades competition Tuesday at the career center. The competition was an experience that seniors Andrew Klay and Klarissa Staley said has helped prepare them for future careers. Klay, who placed first in the metal inert gas welding competition Oct. 18, said he had a great experience. At his current job, he does MIG welding and plans to open his own business once he graduates. Staley, who placed first in the chicken fabrication competition, said she had a wonderful experience. She said her culinary art courses prepared her for the competition. The skilled trades competition was one of multiple events during MakerFest, a three-day event for Lima-area talent to connect with employers in manufacturing, healthcare, service and skilled trades. It is a Link Lima workforce initiative of Greater Lima Region Inc.
A total of 31 Apollo students were recognized and presented with medals for their performance in the competition. The students were also awarded the Maker Cup trophy for winning the skilled trades competition, beating out Wapakoneta High School, Lima Senior High School, Tri Star Career Compact and Vantage Career Center. Students at Ada High School were also awarded individual medals and the STEM Maker Cup at Ada High School Tuesday. Apollo Superintendent Keith Horner said he is extremely proud of the students. Jeff Sprague, CEO of the Allen Economic Development Group, said the competitions help showcase the talent in the area. Doug Arthur, Link Lima/Allen County program director, said the competitions help attract talent to the area. 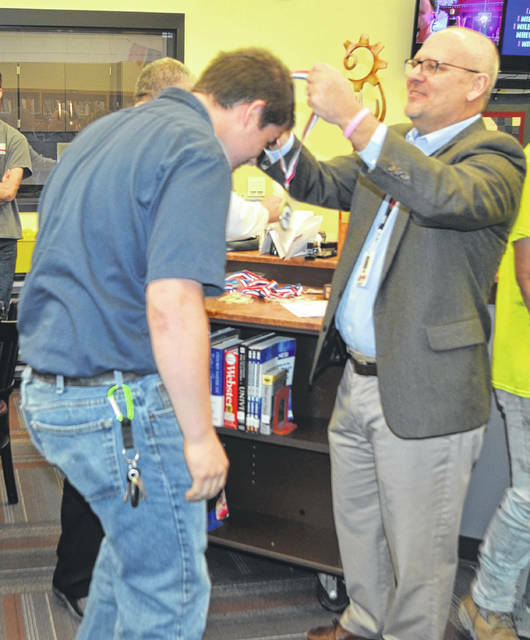 https://www.limaohio.com/wp-content/uploads/sites/54/2018/10/web1_Klay-2.jpgApollo Career Center Superintendent Keith Horner presents Apollo Career Center senior Andrew Klay with his gold 1st place medal from the Makerfest skilled trades competition at the Apollo Career Center, Tuesday. https://www.limaohio.com/wp-content/uploads/sites/54/2018/10/web1_Maker-Cup.jpgJeff Sprague, Doug Arthur and Keith Horner present Apollo Career Center students with individual awards from the Makferfest skilled trades competition and the Maker Cup at the Apollo Career Center, Tuesday.